Johnsongrass in Pastures: Weed or Forage? Johnsongrass (Sorghum halepense L.) is a warm-season grass. Originally from the Mediterranean region, it was introduced to North America in the 1800s as a forage alternative. The name “Johnsongrass” refers to Colonel William Johnson, who introduced this species to his river-bottom farm in Alabama in the 1840s. Today, Johnsongrass is found in all states except Minnesota, and is considered a noxious weed in 19 states (NRCS, 2016). Johnsongrass is popularly known as “the weed we love to hate and hate to love.” We “hate to love” it because it is one of the most common weeds in 30 different crops including corn, sorghum, cotton and soybeans. It also serves as a host for several insects, disease pathogens and nematodes of corn and sorghum. On the other hand, we “love to hate” it because it is not only a valuable forage due to its high yield, palatability and quality, but also is successful in reducing soil erosion as a plant cover alternative (Warwick and Black, 1983). Figure 1. Established Johnsongrass along a fence line. A Johnsongrass seedling can resemble a corn or sorghum seedling; however, its stems and leaves are narrower and completely hairless. In any developmental stage, Johnsongrass leaves have a very distinct and prominent white mid-vein, which differentiates it from most other grasses (Figure 2a). Adult plants can range in height from 2.5 to 7 feet tall. Johnsongrass is a bunch-type grass, tillering from the crown of the plant. The flower head is a panicle (highly branched) and can reach up to 1.5 feet long. It has a green central stalk (i.e., rachis) that contains several whorls of two to three lateral branches. The branches are perpendicular to the stem at the bottom and parallel at the top, resulting in a pyramidal-shaped head (Figure 2b). The seeds, which are very small (2 to 3 mm) and egg-shaped, attach to the lateral branches and turn from greenish-violet to dark reddish-brown when mature. Both roots and rhizomes (i.e., horizontal underground stems) are found on Johnsongrass plants. Most other grass species that resemble Johnsongrass do not contain rhizomes. Rhizomes are white to brown in color and may contain purple spots and nodes covered by brown scaly sheaths (Figure 2c). The leaf collar, where the leaf sheath and leaf blade meet, can serve as a useful identification tool. Pulling the collar back and detaching it from the stem will reveal the presence of a toothed membrane called the ligule. With age, some ligules may develop a fringe of hairs in the upper portion (Figure 2d). Figure 2. Visual clues to identify Johnsongrass. Johnsongrass is an aggressive perennial. Either new shoots from rhizomes or new seedlings will sprout during early to mid-spring. Seeds start to germinate when soil temperatures reach 70 F; however, new shoots from rhizomes will sprout when soil temperatures are 60 F. Sprouts from rhizomes develop faster than seedlings by taking advantage of rhizome carbohydrates accumulated during the winter. Plants start to produce new rhizomes after five to seven true leaves have developed. This occurs approximately three to six weeks after emergence. Flowering will commence six to nine weeks after emergence, and viable seeds will be produced two to three weeks after flowering. During the fall, Johnsongrass growth ceases when soil temperatures return to 60 F, turning the plant dormant. In Oklahoma, Johnsongrass will start to grow by the end of March, and new rhizomes will start to develop by the end of April. Flowering will start in early June and viable seeds will appear in late June. Additionally, new rhizomes, flowers and seeds will continue to be produced until early November, when plants turn dormant. Johnsongrass is adapted to a wide range of soil types within a pH range of 5 to 7.5. Therefore, Johnsongrass is mainly found in arable lands, orchards, open waste grounds, roadsides, pastures, irrigated canals and ditches. It grows best in fertile lowland soils. It is not adapted to poorly drained clay soils, but it can tolerate short periods of flooding. Rhizome production also is affected by soil type. Greater rhizome production and depth will occur in lighter-textured soils. For instance, clay soils will allow only half of the rhizomes that are capable of being produced in sandy loam soils. In addition, most rhizomes in clay and sandy loam soils will reach depths of 3 and 5 inches, respectively. Johnsongrass is very competitive and has desirable forage traits. It has relatively high quality and produces comparable yields (2 to 5 tons per acre) to other summer forages. Furthermore, Johnsongrass is highly palatable prior to reproductive growth. However, its palatability and quality quickly decrease after flowering, and cattle will avoid it. Table 1 compares forage dry yield, crude protein (CP), and total digestible nutrients (TDN) among Johnsongrass and other common forages. Values demonstrate that Johnsongrass, when correctly managed, can be a good forage option and comparable to bermudagrass and other common perennial forages (introduced and native). Table 1. Forage dry yield, crude protein (CP) and total digestible nutrients (TDN) of summer forage crops. Johnsongrass has some management considerations when used as a forage. The first is its high susceptibility to overgrazing. Cattle often kill Johnsongrass stands by grazing it to the ground. To maintain good Johnsongrass stands in pastures, start grazing or haying before flowering—when plants reach 12 to 18 inches—and stop when plants are grazed down to 6 to 8 inches. As previously discussed, rhizome energy will be very low before flowering; hence, grazing all of the leaves and stems at this stage will eventually starve the plant to death. Keeping a 6- to 8-inch stubble height also will maintain growing points and leaves, assuring regrowth back to 12 to 18 inches if a rest period of 30 to 45 days is allowed. This management strategy will not only help maintain forage quality, but also will maximize animal gain, avoid seed production and decrease infestations in neighboring field crops. • never introduce horses to Johnsongrass because it can result in equine cystitis. For more information on nitrate and prussic acid poisoning consult the factsheets PSS 2903 Nitrate Toxicity in Livestock (available at: http://factsheets.okstate.edu/documents/pss-2903-nitrate-toxicity-in-livestock/) and PSS 2904 Prussic Acid Poisoning (available at: http://factsheets.okstate.edu/documents/pss-2904-prussic-acid-poisoning/). 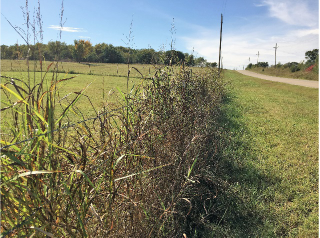 Most producers prefer to control Johnsongrass in their pastures due to the management considerations previously described. Improved forages exist that have faster growth rates than Johnsongrass with no poisoning concerns. Prevention of Johnsongrass is the best line of defense against unwanted plants in pastures. Prevention practices include using weed-free seed, avoiding driving machinery through Johnsongrass stands, cleaning equipment after moving from an infested area and managing field margins. If Johnsongrass does become established; cultural, mechanical and chemical tools can be effective. The easiest and most profitable way to control established Johnsongrass in pastures is to overgraze or continuously mow. Understanding the changes in rhizome reserves is key for management of Johnsongrass. Rhizome reserves will be minimal—from one to four weeks after emergence—as new sprouts are taking up all of the reserves for leaf and stem growth. Removing the leaves and stems at this stage will leave the plant without energy for regrowth. However, rhizome reserves will be reaching its maximum after flowering, when the plant starts to senesce. Removing leaves and stems at this stage will promote more leaf and stem growth if the weather is suitable for growth. Mechanical control is another option, but is more expensive. Fall plowing to a depth just below the rhizomes (3 to 5 inches) is very effective because it will bring the rhizomes to the soil surface and expose them to killing temperatures. Disking has the opposite effect. It will increase infestations by cutting the rhizomes into pieces that will eventually sprout as new plants. However, combining disking with proper herbicide applications can effectively control Johnsongrass as wounds promote herbicide absorption. For the best results, make postemergence applications when Johnsongrass is actively growing and is at least 18 to 24 inches tall and up to the heading stage. See Table 2 for herbicide control options. Before applying any herbicide, always consult the label for appropriate rates, the addition of surfactants, tank-mix partners, plant-back intervals, geographic restrictions, spray carrier volume, nozzle selection and other special instructions. Table 2. Herbicide options for Johnsongrass control in pasture. a Abbreviations: PPI=preplant incorporated, POST=postemergence, PRE=preemergence, PR=pasture renovation, ST=spot treat, WA; wiper applicator. Ball, D.M., C.S. Hoveland and G.D. Cacefield. 2007. Southern Forages, 4th ed. Potash and Phoshate Institute and the Foundation for Agronomic Research. Natural Resources Conservation Service (NRCS). 2016. PLANTS Database. Available at: http://plants.usda.gov/core/profile?symbol=SOHA. Data retrieved on 11/17/2016. United States Department of Agriculture. Warwick S.I. and L.D. Black. The Biology of Canadian Weeds. 61. Sorghum halepense (L.) PERS. Can. J. Plant Sci. 63: 997-1014.